« CELEBRATE LADY DEATH DAY & SHARE! LADY DEATH: APOCALYPTIC ABYSS #1 KICKSTARTER REWARDS – REVEALED! The time has come! Here’s your advance preview of the Kickstarter rewards for the upcoming Lady Death Kickstarter! Be sure to mark your calendars because LADY DEATH: APOCALYPTIC ABYSS #1 is premiering on KICKSTARTER tomorrow (Wednesday, February 7, 2018) at 7:00PM Arizona Time! To download the full rewards lineup as a PDF, simply click HERE! You hope you join us for the Apocalyptic Abyss Kickstarter! Your support means the world to us and we simply cannot do this without all of you! New to Kickstarter? Create a free account here so you’re ready to pledge when we launch tomorrow! BRIAN PULIDO FACEBOOK LIVE PRE-SHOW PARTY – FEBRUARY 7 AT 6:30PM (AZ TIME) – JOIN US! Make sure to follow Brian Pulido on Facebook so you can party along at home as we broadcast LIVE the LADY DEATH: APOCALYPTIC ABYSS #1 KICKSTARTER PRE-SHOW PARTY! Join us as we countdown the minutes to the LADY DEATH: APOCALYPTIC ABYSS #1 KICKSTARTER LAUNCH at 7:00PM Arizona Time! Will it be the biggest one yet? IT’S UP TO YOU! LADY DEATH #1 – 24TH ANNIVERSARY & VALENTINE’S DAY CELEBRATION! Roses and chocolates are for suckers! What your significant other really wants is more Lady Death! These new comics, prints and more will be available for order at Lady Death Store starting Wednesday, February 14 at 9:00AM Arizona Time! Don’t have a date for Valentines? Don’t worry, Lady Death will always be there for you, but you just might lose your heart! Limited to the number of copies ordered by Monday, February 19 at 9:00AM Arizona Time! Sturdy BCW Comic Stor-Folio featuring custom box art on the front and spine. NOTE: Box only. Comic books not included. Full color 11×17″ print on premium glossy stock. 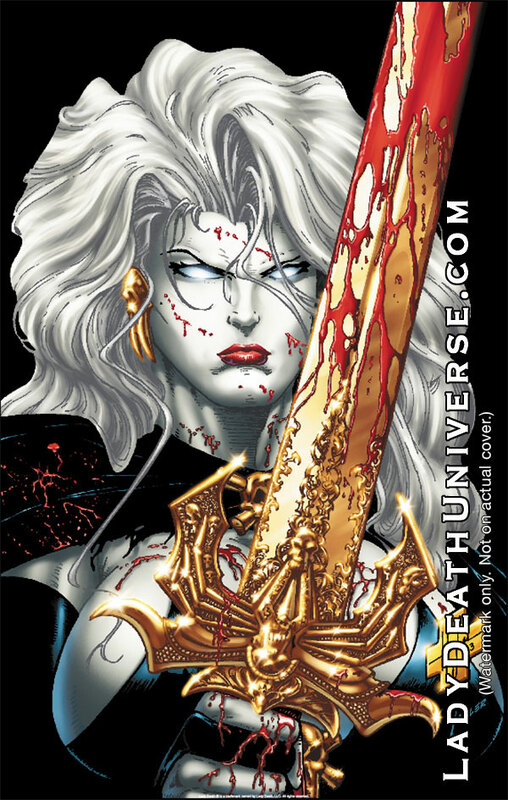 CELEBRATE “LADY DEATH DAY” ON FEBRUARY 9TH! February 9 shall be known now and forever as LADY DEATH DAY, where fans across the globe join together celebrate the publication of Lady Death’s very first issue back in February 1994! Bring your comics, merch and apparel around with you on Lady Death Day (February 9th) and SNAP PICS & POST THEM to social media to WIN PRIZES! We also have this awesome Lady Death Stand Up! 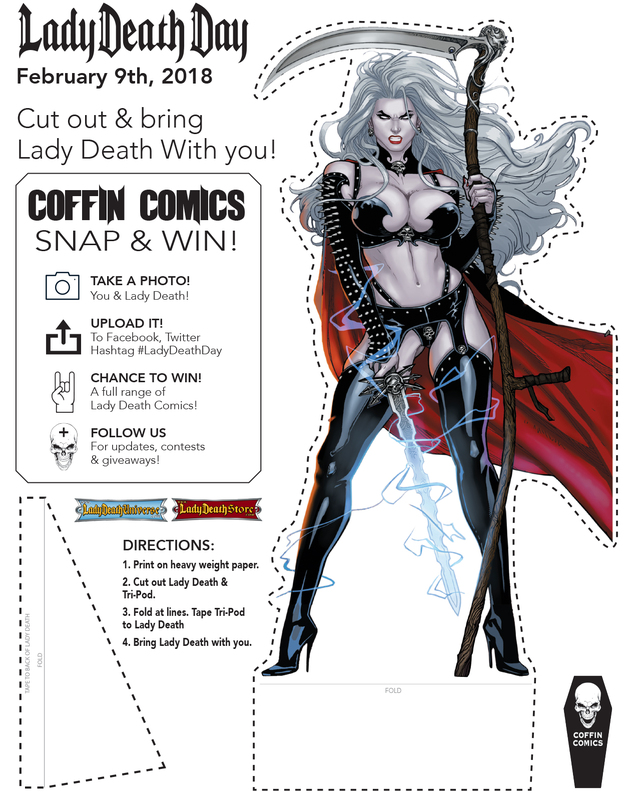 This is a high resolution cut out of Lady Death for you to use in your social media posts! To download the full-res version, click the image above! FEBRUARY 17 – AZVENTURECON – LADY DEATH 24TH ANNIVERSARY PARTY! 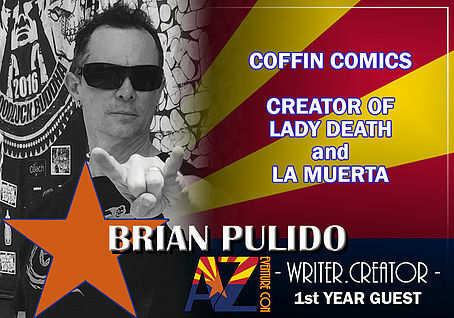 Brian Pulido and Coffin Comics will be guests at AZeventure Con, taking place on Saturday, February 17 from 12:00-5:00PM Arizona Time to celebrate Lady Death #1’s 24th Anniversary! This show is FREE TO ATTEND!!! This will be Brian Pulido’s ONLY appearance in AZ until Phoenix Comic Fest in May! Be there! New exclusives by Mike DeBalfo, Jeremy Clark and Sanju Nivangune are coming! MEET BRIAN PULIDO AT EMERALD CITY COMIC CON! The show takes place March 1-4, 2018 at the Washington State Convention Center in Seattle, WA. Stay tuned for ECC Lady Death exclusives! This entry was posted in Kickstarter, Product News and tagged 24th anniv, apocalyptic abyss, azventurecon, eccc, emerald city, facebook live, kickstarter, lady death, party, preshow, rewards reveal, valentine, valentines. Bookmark the permalink. Both comments and trackbacks are currently closed.